Susan Udelhofen and Brikny Ayala at the VAHS Awards night. 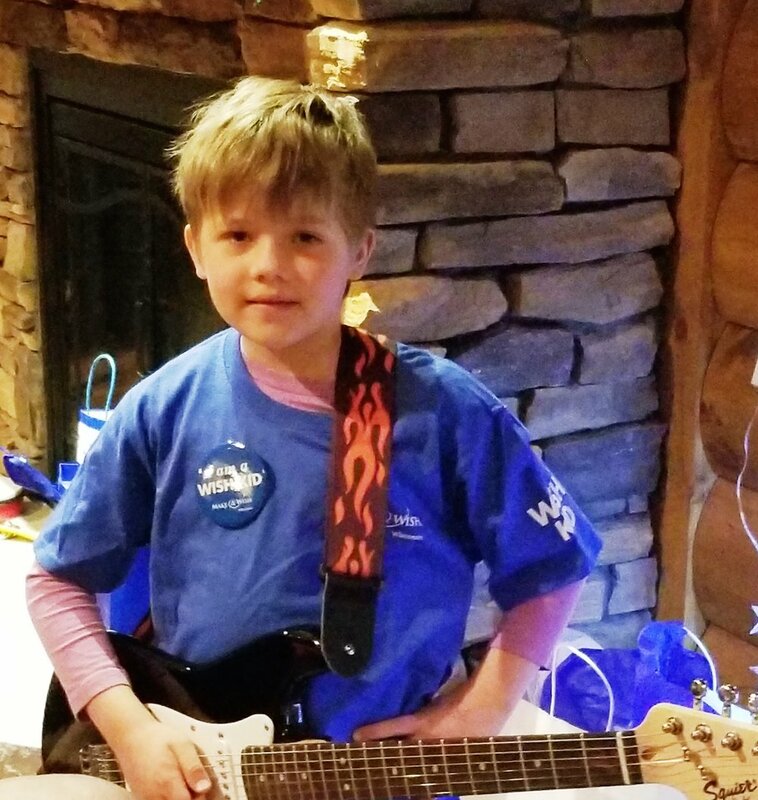 Wish recipient ilya with his new guitar. Erin Gloria waiting for her wish to go to disney world. Katie’s Daughter, Gracie proudly presenting the check to make-a-wish wisconsin. On May 9th, at the Verona Area School Awards evening, we presented Brikny Ayala with the second annual Katie Udelhofen-Clark Memorial Scholarship. There were a number of things in Brikny’s essay that stood out to us as we read through the many applications. Like Katie, she will be attending UW-Milwaukee majoring in psychology. Becoming a physician working in the mental health field is her long-term goal. Her belief in “giving back” especially to those who are underserved in our society, and her work as an intern at the Carbone Cancer Center, all make Brikny the perfect choice. She is a hard working, remarkable young woman and we wish her the very best as she begins this new chapter. On July 19th we, along with Gracie, awarded the checks to Make-A-Wish Wisconsin and Carbone Cancer Center. The funds raised this past spring made it possible for us to grant two wishes. The first wish was for Ilya a 6 year old boy from Middleton battling leukemia. His wish was to have a guitar and all of the accessories. He is now a rock star! The second wish was for Gloria, a 3-year-old little girl from Madison who is battling acute lymphoblastic leukemia (the same type of leukemia as Katie’s). She wishes to go to DisneyWorld. Her wish will be granted after her current round of chemotherapy. We look at these little faces and know we are bringing joy to their challenging lives. We thank you for making their wishes come true! Wouldn’t Katie be pleased? When we arrived at the Carbone Cancer Center at UW Hospital we were met with the entire blood cancer team; Dr. Ryan Mattison (the Dr. who cared for Katie at Carbone), Dr. Aric Hall (the Dr. who was the spokesperson during Katie’s Birthday Benefit), Dawn Reininger, (Katie’s oncology nurse), Dr. Mark Juckett (the Dr. working with us and our nonprofit), Dr.Howard Bailey (the Head of the Carbone Cancer Center) and Amy Manecke, (head of fundraising). It was an emotional however, a funny moment occurred after the first picture was taken when Gracie spoke up and said, “Okay now we need a funny one!” Hence the second photo of all of us attempting to “be funny”. This research will study a new way to do transplant in people with really bad leukemia (AML or ALL) that have a high risk of relapse. We are hoping we can reduce the risk of rejection problems while enhancing the anti-leukemia effects of the donor immune system. It is the kind of protocol we might use for someone like Katie who had high-risk ALL. This type of research gives us hope that our efforts can make a difference for another person like Katie. We sincerely wish that you all could have been with us as we awarded our checks to Make-A-Wish and Carbone Cancer Center. It was your support of “We Believe In Katie” that made this happen and will impact the lives of so many. We truly are “paying it forward”. You have our sincere gratitude.